According to Max Weber, power offers the possibility to enforce one’s own will against resistance. Power, which is particularly present in the political system, is used in different political worldviews to achieve different social goals, whereby spatial arrangements are also interpreted differently (conservatism prefers rural spaces, socialism urban ones, which unites it with liberalism, which, however, also values suburban spaces positively). The approaches to critical landscape research presented in this chapter are united by the rejection of current social power relations. What they have in common is a critical attitude towards the state, albeit from different backgrounds. Critical theory sees in it the vicarious agents of economic interests, by means of state organs (especially schools) social structures (i.e. the dependence of the human being on the economy) are to be perpetuated. Bourdieu expands the basis of critique by not only evaluating economic interests as drivers of an educational system that maintains power relations, but also including other components of ‘symbolic capital’. Liberal approaches, on the other hand, criticize the educational system’s function of suppressing alternative interpretations of the world by forming discourse sovereignties and thus restricting individual freedoms. Accordingly, the discursive hegemonialization of ‘expert special knowledge’ (see Chap. 4) is criticized here, as are the bureaucratic inscriptions into physical space (such as subsidies), which in turn are conveyed as ‘beautiful landscapes’ in education. 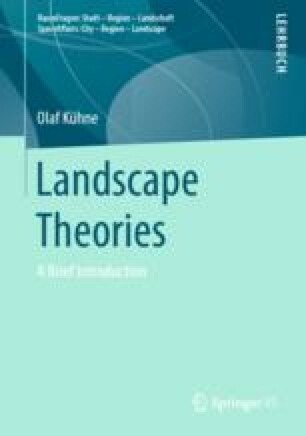 From Bourdieu’s perspective, the question of how landscape becomes a medium of social distinction in order to secure the symbolic power of the ‘ruling class’ is in the foreground. From the point of view of ‘critical theory’, the question of how to prepare physical space for economic interests and its social landscape’s aesthetic charge is specifically focused.